To clear things up: Yes, the owners are wholly responsible for the lockout. 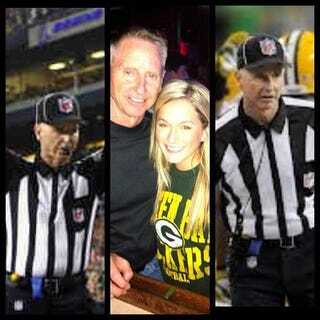 But we identify and delve into the backgrounds of the replacement refs not to be mean, but for two legitimate reasons. First, they're scabs, and without them crossing the picket line, the lockout would have been over months ago. And second, fans really ought to know how inexperienced and incapable some are, because the NFL sure as hell isn't going to make that information public. The level of football, style of training and evaluation, method of film study, crew interaction and competition are all designed to match the experience of being a Division-I football official. That is the purpose of the Stars and Stripes Academy – To prepare officials for Big Time football. The Academy instructors are all current BCS level officials who have worked Conference Championships and/or National Championships. They want to help you get there too. But Easley wasn't ready for the jump yet. According to Karl Richins, an instructor at the academy, Easley didn't yet have what it takes to work Division I football, let alone the NFL. "I got to know Lance at a June academy I worked at in Reno and when he came to my academy in July," Richins said. "He's a very polite, good Christian gentleman, a good father to his son, Daniel, who was at my academy as well. "But was Lance ready to work at the NFL level? Absolutely not." Richins' staff determined that Easley, vice president of small business banking at Bank of America in Santa Maria, Calif., wasn't ready for Division I, the highest level of college officiating, never mind the much faster NFL game. The academy wrapped up on July 8, mind you. A month later Easley was working NFL preseason games. The league and the NFLRA met for talks last night. The owners are reportedly not willing to compromise. Easley could be working your favorite team's game this Sunday.